I originally wrote a series on .Net Core when it was still a 1. * version. Now there is a 2.0, they have changed/fixed so much that it is truly a 2.0 version, that you can and should use for everything .Net. I will (probably) be only showing instructions from on Windows, but all dotnet CLI instructions should be cross-platform. Let's get into it! While written from the point of sdk 2.0, these details should still apply to 2.1, 2.2 and so on as the sdk develops. Updates will be noted if anything drastic has changed. This URL is fun spoke rather than written, dot.net (dot dot net). This is where you go to get started. Dotnet supports multiple versions side by side. Get 2.0 installed and you can get started following along with me. To check you have the correct version to follow along you can open a command line and type 'dotnet --version'. Ok, so you could just go RTFM. But I will still go ahead and produce the Hello World of dotnet applications. The internet will be full soon, I might as well do my bit. Firstly, like with git, we create a new folder and initialise it. In this case, the folder is the equivalent of a project folder. Mine might show more than yours. I have some extra templates installed (more on this later). But I digress. Technically, this is enough for a dotnet app. That's it. The dotnet 'run' command will automatically run the 'restore' and 'build' tasks automatically if it needs to. We have a fully executable .Net Core Application. Let's repeat with Visual Studio now. I have Visual Studio 2017., Even if you don't, you should still have something similar. 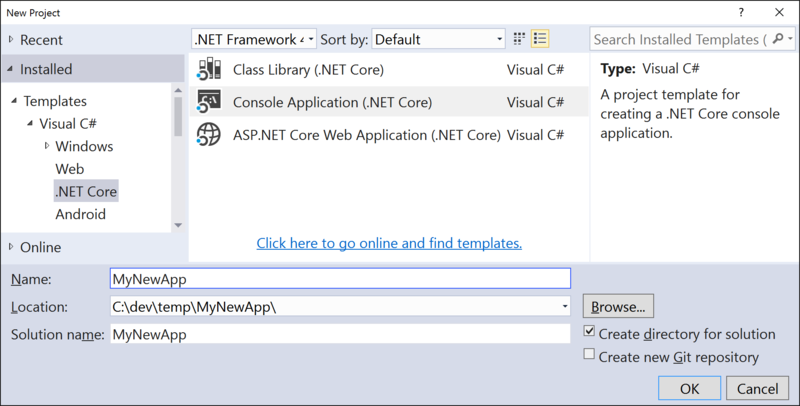 Choose File-> New -> Project and Select the Console Application (.Net Core) template from under the new .Net Core C# category. This is practically identical to what 'dotnet new' added at the command line. Next time we will take a deeper look into the *.csproj file and start to experiment on ways to build more complex applications with .Net Core 2.0.